Consoles and Keanu – what's not to like? 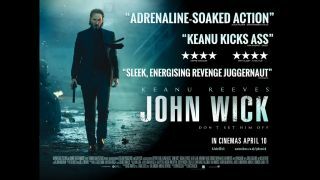 Action favourite Keanu Reeves is back on the cinema screen in the highly-anticipated, ultra-slick 'John Wick', out 10 April 2015. To prepare you for this big screen, action-packed experience, Warner Bros. UK and TechRadar are offering one lucky reader the chance to win a PS4 and a bundle of must-own action films! After the sudden death of his beloved wife, John Wick, (Keanu Reeves) a retired hit man, is forced back into action by a brutal Russian mobster, when his 1969 Boss Mustang catches the eye of sadistic thug Iosef Tarasov - who breaks into his house and steals it, beating John unconscious and leaving his beloved dog Daisy dead. Unwittingly, they have just reawakened one of the most brutal assassins the underworld has ever seen, in 'John Wick', a stylish tale of revenge and redemption. For your chance to win, just simply enter your email address in the form below. Good luck! For more information on 'John Wick' head over to: 'John Wick'. © 2015 Warner Bros. Entertainment Inc. All rights reserved. Motion Picture Artwork © 2015 Summit Entertainment, LLC. All rights reserved.